When you consider your bathroom space, adjectives such as beautiful, relaxing and luxurious may not be the first to come to mind – but they should be. With as much time as we spend in the bathroom, making a space that is enjoyable should be a priority. One of the top features buyers are drawn to when searching for a home is a great bathroom. Do not simply make your space functional, use these trending styles for your bathroom to make it the highlight of the house. Too many bathrooms are still “just bathrooms.” Modern bathroom design is centered around creating a space that gives the homeowner a spa like experience. Simplicity is the key with this style, which utilizes bright color palettes and contemporary sinks and tubs. Vanities are kept simple and lighting soft. The main feature of this design is the feeling of relaxation itself. If you wish for a bathroom space that you can go to and completely unwind at the end of the day, this style is the one for you. The country chic design trend is one that many owners feature throughout their home and the bathroom is no exception. You can give your bathroom area modern country flare by using a paint color that brightens the room and gives a cottage feel, such as shades of blue or yellow. Accessories are the backbone of this style. Incorporate vintage for fancy or burlap for a more casual appearance. Have fun with creating your shabby chic bathroom space – make it your own. This is a design that never goes out of style. The beach is a relaxing paradise for many of us, it is only natural that owners would want to bring that to their bathrooms. Bamboo, shell collections and shades of blue and green are all commonly featured in beach style bath areas. You can bring a contemporary style to your design by installing streamlined sinks and bathtubs with modern faucets. Every day can be a day at the beach when your bathroom design creates your personal beach retreat. This is a style for those who do not want a simple design. If you want to feel like a monarch in your bathroom, use gold, rich woodwork, antique vanities and sparkling chandeliers. Highly detailed bathrooms are appealing and offer an elegance that other designs may fall short of in comparison. The bathroom in your home can be a top feature with the right design. Time in the space should be enjoyed just as much as you enjoy spending time in other areas of your home. 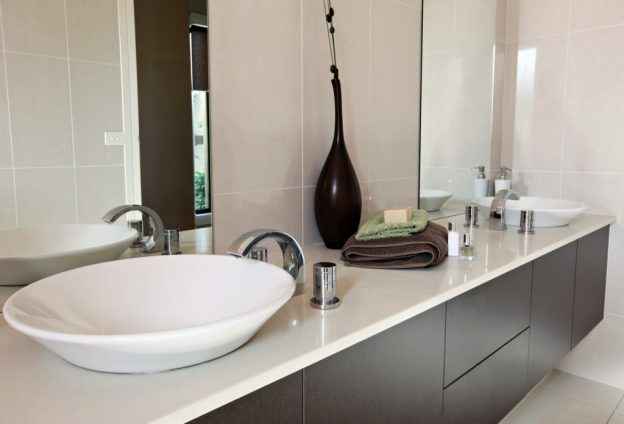 If you are planning to sell, investing in a modern bathroom that is appealing to many potential buyers could increase the value of your home and get you a great return. These top trending designs for bathrooms are ideas that are sure to bring your space to full potential. For more information on selling your NOTL real estate, visit our seller’s page. This entry was posted in Blog, Uncategorized and tagged bathroom, Real Estate, trending styles on February 11, 2015 by wp_admin.